I have to preface this review by saying that Crimson Peak may be the most beautifully shot film of the year, working to make a truly original-looking film that complements the rest of director Guillermo Del Toro’s macabre oeuvre. As referenced in the film, this is a story with ghosts in it, not about ghosts, and that may be the greatest strength of an overlong and underdeveloped story that becomes much more interesting just before the credits begin to usher the audience out. We follow the young Edith Cushing (Mia Wasikowska) as she trudges through the Victorian era struggles all too common to the rich upper class, like how to publish her book anonymously and choose the right suitor among two wealthy men vying for her affection. Billed as another fantasy horror project from the mind of the man who brought us Pan’s Labyrinth and The Devil’s Backbone, the film was wholly mismarketed. The majority of the film was played as a Victorian fairy tale romance and it only dabbled into the spectral fears promised by its trailers. The story stands as the major drawback to the film, often resorting to the romance subplot to mask the lack of any truly scary moments in the first two thirds of the film. The characters are all played by actors trying to dig into the melodramatic moments with well-rounded approaches, especially the brother/sister duo of Tom Hiddleston and Jessica Chastain, but end up being restrained by the lack of characters who act like they are written instead of lived in. Coupled with sometimes incoherent editing choices, the film looks to have needed more time in the oven before its release. All of this adds up to a film that should be a lot better than it was. This does not make the film an altogether bad experience, though. Several jump scares work to chill the viewer and the tension is elevated to its peak with the film’s final sequence, but the majority of the scares and tension seem unearned due to the lack of any character development and reasoning. Del Toro and cinematographer Dan Laustsen present the film in rich reds that launch off the screen to the viewer. The set and costume designers seem to have put many hours of work into the the film, so much so that it only emphasizes how underwritten and underwhelming the film is as a whole. 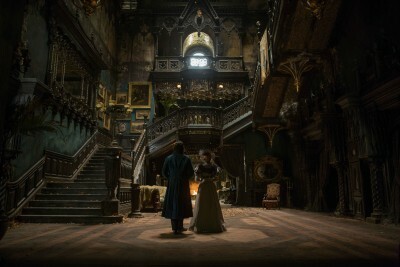 For those looking to find a horror film this upcoming Halloween season, this will suffice better than the now downtrodden experience of the Paranormal Activity series, but you will be hard pressed to find anything to dig your teeth into that sends a shiver down your spine with Crimson Peak. 2.8/5 Loops.